Here are answers to some commonly asked questions that give more specific information about where we stay and how we handle all of our gear on our trips. Adventure Treks and outdoor enthusiasts often use the terms frontcountry and backcountry when referring to the wilderness. Frontcountry refers to a campground that has amenities like running water, toilets, picnic tables, etc., and is close to town with easy access to a grocery store or gas station. Frontcountry sites can be found at state parks, national parks, or private campgrounds, and you can usually drive up to them—you do not have to hike to a campground in the frontcountry. When Adventure Treks trips stay in the frontcountry, we have all of our gear and food with us. We regularly restock several large coolers with ice, and we have access to fresh food like fruits, vegetables, and meat from nearby grocery stores. Often groups will stay at these campgrounds when they are doing activities like mountain biking, climbing, or whitewater rafting—activities accessible by road. 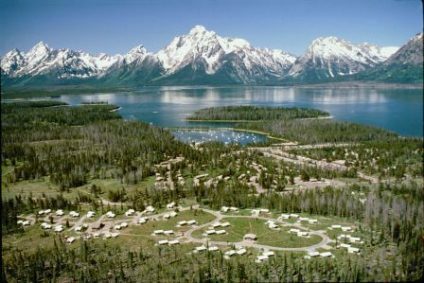 We avoid heavily trafficked frontcountry campgrounds whenever possible so that it still feels like we are in the wilderness (the photo above shows a frontcountry campground on the Yellowstone Teton Adventure). If you have ever stayed in a national park and woken up to a gorgeous view the next morning, you have a similar picture to the types of frontcountry campgrounds Adventure Treks uses. The term backcountry refers to wilderness areas that are remote—meaning you have to hike, canoe, bike, etc. to get there instead of driving right up. Being in the backcountry also means being away from amenities like running water and toilets. Many of our activities at Adventure Treks include backcountry camping, including all of our backpacking trips, canoeing, and sea kayaking. Being away from amenities usually begs the question, “how do we use the bathroom? !” On the second and third day of each Adventure Treks trip, we’ll thoroughly cover how to use the bathroom in the woods. This can be an intimidating thought to a new student, but don’t worry—it becomes second nature very quickly! Parents often wonder if their students have to carry their fully-packed duffels all of the time—fortunately, this is definitely not the case. Think of a duffel at Adventure Treks as a closet. Duffels are stored and locked in the U-Haul trailer that we tow throughout the trip, and students will pull whatever items they need for the next activity out of their duffels and pack them in their backpacking packs, daypacks, or dry bags (for water activities). After that activity, dirty clothing goes back into the duffel until laundry day. 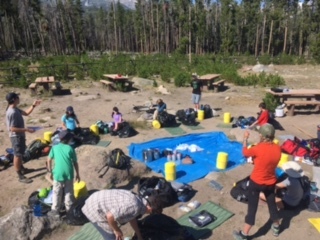 When we’re at frontcountry campgrounds, students will carry their duffels a short distance to their campsites to organize their personal belongings and prepare for the next activity (see the photo above, where students are packing for a Colorado Explorer backpack in Rocky Mountain National Park). We will set up a line called a “duffel shuffle” to unload the U-Haul, so we do ask that students not bring wheeled baggage, as they’re hard to navigate in gravel, dirt, and grass, and they’re harder for students and instructors to pass through the line. Each trip’s packing list guides families through what kinds of items to purchase and how to pack. (Trip-specific packing lists can be found on each online trip page and in your CampInTouch account.) The packing lists are very thorough and have been refined and perfected over the past 25 years. If your student has everything on the list, he or she will be set for the trip. Please do not leave any items out, nor is it necessary to pack anything extra. It is essential for students to know what gear they have and where their items are, so we highly recommend including your child in the packing process. If your student packs his or her duffel alone, fantastic! But please confirm that everything is included to make sure nothing is left out. While we may be able to purchase a forgotten item while on a trip, it is much easier to buy any last-minute items at home before your student leaves. Trips do not have easy access to outdoor clothing stores. You might ask, how do we organize items in the duffel? Again, use the closet analogy. You can locate items in a closet more easily when they are folded or on hangers. Similarly, on an Adventure Treks trip, it’s much easier for students to locate clothing and toiletries when those items are organized in their duffels. Ziploc bags and stuff sacks are great options for organizing clothing and gear. I like to use one large Ziploc or stuff sack for shirts, one for warm baselayers, one for socks, one for miscellaneous items like hats and gloves, and so on. We do a lot of packing and repacking, and being organized from the very beginning will help set your child up for success. Also, we cannot overemphasize the importance of labeling everything you send with your student with his or her name, from shirts to boots to hats to socks. A Sharpie is all you need for this. You’d be amazed at many pairs of socks end up in the lost and found bin (aka the bag of doom). We’ve had students forget and “lose” everything from a daypack to hiking boots. Again, please label your student’s items! Please click here for more tips on packing for airport days and for a helpful gear video. Please also utilize the Adventure Treks office as a resource: We are always happy to answer any questions about gear—give us a call at 828-698-0399 anytime.